A decent premise that gets lost in the mix as it goes on and becomes a very ordinary movie after all. 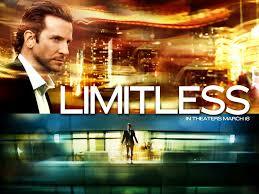 Limitless is a movie about a guy who finds a pill that suddenly makes him a genius. He’s a down and out writer, and a bit of a loser as well, being dumped by his girlfriend, and looking likes a burned out slacker. Bradley Cooper is the guy, and the movie opens up with his voice over explaining who he is and what he’s all about. Shortly after the movie begins, he runs into the brother of one of his ex-girlfriends. This guy was always involved in drugs, either doing them or selling them, and now he’s got one that he’s telling Bradley Cooper all about. Cooper takes the drug home and doesn’t give it much serious thought at first. But then he starts thinking about how nothing is going right for him and how he’s really got nothing at all to lose, and so he gives the pill a try. Suddenly his world opens up. The colors on the screen change from dull to bright. He stands there, frozen in place and watches as another version of him walks up the stairs. Is this the new him or is he the one frozen, watching his other self and realizing how ridiculous he used to be? Either way, it’s pretty cool. He talks to the landlord, who is furious with him for being so far behind on the rent, and he calms her down by saying all of the right things. He ends up sleeping with her. Now Cooper’s voice over takes us through everything this pill does for him, allowing him to see twenty Possibilities for every situation he encounters. He starts playing the stock market, borrowing money from bookies and investing it. And every one of his ideas pays out tremendously. He’s an overnight sensation and he quickly becomes addicted to the success. He even gets back his girlfriend, who dumped him at the start of the movie. At this Point the premise has been fully established and now it’s time to see where it leads. Cooper’s path encounters two major players. 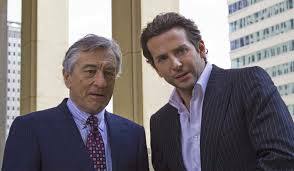 The first is a big time stockbroker, a man named Leland Van Ores played by Robert Deniro. He’s a guy that we keep hearing about over and over again, long before we meet him, as some kind of mega-investor where everybody knows his name. And he wants to take Cooper on as an employee and allow this new protégé to advise him on future investments. The other character who now enters into the plot in a major way is the bookie; played by a Jason Stratham look-alike (they couldn’t get the real thing?) this bookie being in the plot at all is one of the stupider things in this movie, because Cooper doesn’t pay the bookie back. In life, when you borrow money, you try to pay it back fast. Now, I understand that sometimes you lose it, through gambling or something, and so you can’t pay it back, but Cooper doesn’t lose it, he triples it. So there’s no reason why he doesn’t pay it off. And considering he’s on a drug that supposedly allows him to see every Possibility, it doesn’t really make sense how he doesn’t see that not paying the bookie might lead to something bad. Common sense, if you borrow from a bookie and you don’t pay him back, he’s going to come looking for his money. Cooper also has other problems, such as a new revelation about the drugs harmful effects. He learns, from the sister of the guy who gave him the pill, that many people who tried taking the pill ended up dying down the road. So he knows he’s got to get off it soon, but can’t really stop so easily. Another problem is that clearly there’s someone after him. The guy who gave him the pill to start with turned up dead, and now there is this mysterious and creepy man following both him and his girlfriend. When the girlfriend catches on and realizes that this man is after her, she Pops one of the pills herself while in central park, and can suddenly see a ton of Possibilities for getting away. What does she come up with? Run out onto the ice of an ice skating rink, grab a little kid, lift and spin her in the air, and use the kid’s skates to slice the bad guy. Are you serious? Put a little kid in danger? You’ve got a pill that allows you to see all these ideas and that’s what you come up with. The reasons why this movie falls apart as it goes on are that it really just becomes one chase scene, pursuit, or attack after another. And while this is supposed to be a movie about smart people, the decisions they make are incredibly stupid. I don’t believe that just because he saw a Bruce Lee movie as a kid or watched a documentary about fighting once, Cooper is now able to call up the memories of those movies and by doing that suddenly knows how to fight. Give me a break. This isn’t the matrix where you call the operator and tell him you need to know how to fly a helicopter and he presses a button and suddenly you know how. The movie definitely starts off on the right foot with the idea of the drug, Bradley Cooper’s voice over explaining things to us, and the way the effects of the drug are brought to life. It’s an interesting success story, but once it goes into action mode and starts caring more about giving us chases then it does about giving us a smart storyline, the movie plummets downhill. Bradley Cooper even has a scene where he drinks a puddle of blood off the floor of his apartment. I understand how the movie tries to explain why he does it, but it’s still just so stupid. and Robert Deniro really doesn’t do much here. he looks good in the part, but the part doesn’t offer all that much to the plot. It’s a movie that had a decent initial plot, but had no idea how to carry that out into a full movie and make it worthwhile. It definitely gets worse and worse as it goes on.